Painter and print maker Giovanni Battista Tiepolo was born on this day in 1696 in Venice. 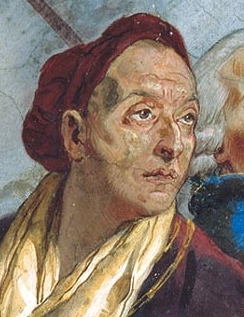 Also sometimes known as Gianbattista or Giambattista Tiepolo, his output was prolific and he enjoyed success not only in Italy, but in Germany and Spain as well. Highly regarded right from the beginning of his career, he has been described by experts as the greatest decorative artist of 18th century Europe. 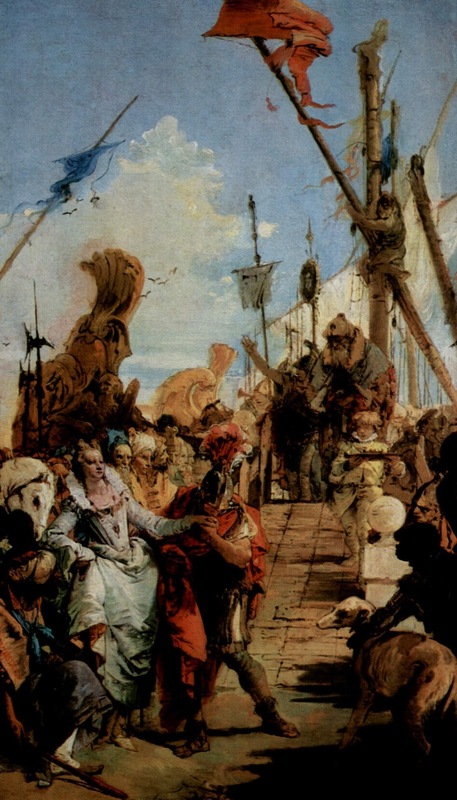 Although much of his work was painted directly on to the walls and ceilings of churches and palaces in his native Venice, many of Tiepolo’s paintings on canvas are now in art galleries all over the world. Tiepolo was the youngest child of a Venetian shipping merchant who died a year after his birth leaving his mother to struggle to bring up her six children alone. In 1710 he became a pupil of Gregorio Lazzarini, a successful established painter, but Tiepolo quickly developed a style of his own. His earliest known works are depictions of the apostles, which form part of the decoration of the interior of the Church of Santa Maria dei Derelitti at Ospedaletto in Venice , painted in 1717. Tiepolo was commissioned to produce portraits for the Doge and he started painting frescoes directly on to the walls of churches in 1717. In 1719 Tiepolo married Maria Cecilia Guardi, the sister of painters Francesco Guardi and Giovanni Antonio Guardi and they had nine children. Two of his sons, Domenico and Lorenzo, eventually painted with him as assistants. Tiepolo was commissioned to produce paintings for many churches in Venice but also for the interiors of palaces in Milan and for the Colleoni Chapel in Bergamo. At the request of a German prince, Tiepolo travelled to Wurzburg in 1750 to produce ceiling paintings for his palace. He returned to Venice where he continued to produce paintings for churches and palaces until in 1761 he was invited to Madrid by King Charles III to create a ceiling fresco for the throne room of the Royal Palace. He fulfilled other commissions in Madrid, although he had to put up with jealousy from the other artists working for the king at the time. Tiepolo died in Madrid in 1770. Palazzo Labia in Fondamenta Labia in Venice has frescoes in the ballroom depicting the life of Cleopatra, painted by Tiepolo between 1745 and 1750. The prestigious palace is on the wide Cannaregio Canal , close to its junction with the Grand Canal , but the entrance to it is off Campo San Geremia. The palace sometimes holds free classical concerts in the magnificently decorated ballroom, or visitors can arrange to see the frescoes by appointment. The Church of the Gesuati in Fondamenta delle Zattere in Venice has a ceiling frescoed by Tiepolo with scenes from The Life of St Dominic. The impressive work of art, painted between 1737 and 1739, demonstrates the artist’s amazing mastery of light and colour.